As a designer, one of my biggest fears is getting tunnel vision. So how do I ensure I am up to date on current design trends? Look. At. Everything. I mean everything! I take time out of every day to read or look over at least one thing that gives me insight into current branding, design, font or logo trends in the world. It helps influence my daily design and keep me on my toes. It’s easy to fall into a rut—especially when you work in-house. Let me share a few resources that have helped me track trends so far in 2019. The branding trends for 2019 divert into two definitive and opposing paths, “futuristic” and “nostalgic,” and consumers use these trends as signals to determine which side your company falls into. Serifs—those little tags at the end of letter strokes—have been a big “no-no” for modern, minimalist branding in the past. But they’re making a comeback in 2019, perhaps because of a return of old-fashioned styles, but mainly due to their unique ability to communicate a brand’s personality. Minimalism: even less details, even more negative space, combined with flashy colors and bold typography, etc. Pentagram is the world’s largest independently owned design studio. Their work includes graphics and identity, architecture and interiors, products and packaging, exhibitions and installations, websites and digital experiences, and advertising and communications. Pentagram is a fantastic source of current design, and it comes from all 23 partners. I recently looked at an environmental digital installation in Bangkok that can help influence our presence at conferences and events. As designers, we have a responsibility to see what else is out there. It’s how we do our job better. Picasso once said that “good artists borrow, great artists steal,” and I think that’s something to remember. Looking at current trends should influence your work. You shouldn’t actually be stealing designs, but it’s important to focus on where design is moving, so you aren’t left behind. Being a meaningful brand can seem like a daunting task, but by looking at everything around you and reading varying perspectives on trends, you can educate yourself to avoid tunnel vision. The hardest part is done—you’ve pulled together information and framed it with the right messaging, and now you have an article, blog update or press release. Ready to post? Not quite. Next comes the essential step of proofreading and shaping the text. When you’re a writer, marketing expert or PR professional, you may not always have access to editors who can fix errors and help polish your work—and for those times, you’ll need to know the basics, so you can be your own editor. Here’s a quick rundown of ways to keep your writing clean and expressive. Is your piece using the right structure? In the process of writing, you may have placed some of the most relevant information further down, rather than at the top. Make sure you don’t “bury the lede,” and always include the main takeaway for the reader in the opening paragraphs. Imagine that a reader would follow a link to your content, then scan only the first few lines before clicking away—what would you want the person to learn in that time? At the end of the piece, insert a call to action, or leave the reader with a memorable statement about the subject. Punctuation is how we break up text to make reading English easy and understandable. If you’re not sure whether to use a comma or semicolon, stick with a sentence structure that you know is correct, or browse the internet for tips. Depending on whether you use AP, Chicago or another stylebook (or your organization’s house style), certain preferences are worth making a habit, so that all material from your company appears consistent. For example, at USGBC, we use AP style, which means we don’t use the serial comma. As an editor, I also look up usage questions in the AP style guide almost daily, to make sure I’ve got things right—it only takes a moment, and it’s worth it for the consistency of our content. A first draft usually contains redundancies. That’s just how writing works, as you put ideas onto the page. As your own editor, you must go back and examine where you can make your content more succinct. Streamlining your message will enhance its impact on the reader. This advice also applies to the title itself—is the title short enough to work for a digital format, but still descriptive of exactly what the piece is about? In an ideal world, you’ll have time to let content sit for a day or two before reviewing it, but attending to another task for even a couple of hours can make it easier to go back to a piece of writing with fresh eyes. Run spell check—and then do your own spell check. Always run the own spelling and grammar check provided in your software, or use another plugin. Nobody’s perfect, and chances are, something has slipped past your first review. It’s easy to rush past common misuse errors, such as putting “principle” where you meant “principal.” These types of mistakes won’t be caught by automated spell check, so look carefully at context to make sure you’re using the right words. Also, to avoid embarrassment later, double-check any proper nouns like the names of people, organizations and geographic locations. With a little extra attention, you can ensure much cleaner, more professional-looking copy. It’s not just about correctness—having enough respect for your readers to put in this effort will pay off, as your readers will, in turn, have greater respect for your organization and trust in its message. Here at USGBC, we serve a wide audience. Architects, policymakers, builders and manufactures come to us for green building content. While their interests have a common theme, all these people from different industries are looking for specific content that is relevant to them. For example, a teacher looking for educational content wouldn’t be interested in a technical update for LEED Building Design and Construction. Consumers expect a personalized experience. Email marketing offers that though a method called segmentation. Segmentation is the process of dividing your users into smaller groups based on their information. A Customer Relationship Manager (CRM) is a database that tracks attributes about your users, such as location, industry and job title. As a marketer, you can use these records to serve highly targeted content to the people who will find it relevant. Email segmentation is only as good as the CRM, so keeping your data clean is key. The more data points you have on your users, the more customized an experience you can give them. Make it easy for users to provide their information. Allow users to edit their profiles within their accounts. Don’t overwhelm them with too many required fields. Realize what data points are important to you, and only ask for those. Too many fields will result in no fields. Make it easy to select different email subscriptions. Users should be able to select only the channels they are interested in. Don’t make your digest all or nothing. Create a dropdown menu to list choices. There are unlimited job titles, so create a list and allow users to choose the one that matches their title most closely. Leverage automation if a user registers for your conference. Make sure that their record is updated to reflect registration. You wouldn’t want to send promotional material about a conference for which someone has already registered. Instead, send them an email about session details and hotel deals. Make sure you capture geography. Where a user works is often the most relevant data point. It’s good to capture what state and country they are in but segmenting by zip code is even better. Connect your other data. Keep a record of your customers’ past purchases. Make sure that the database updates your CRM. What people buy is a pretty good indicator of what they are interested in. When it comes to email lists, a good marketer would take a smaller, more targeted list over a larger, unqualified list any day. Good data plus segmentation equals a personalized experience that will appeal to your customers. 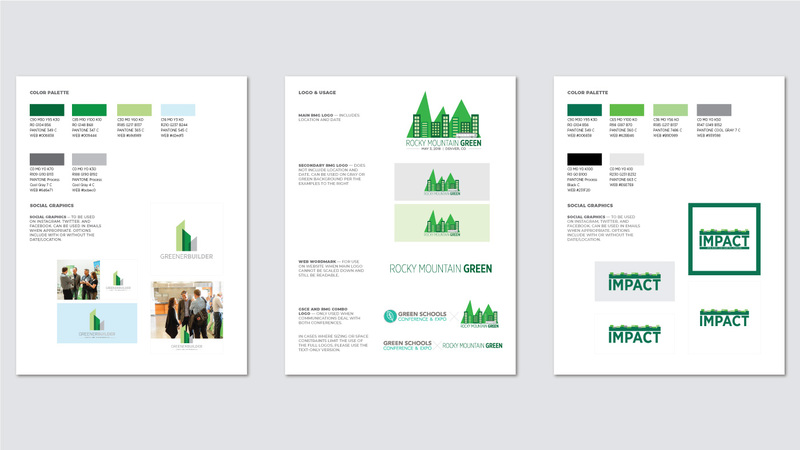 The USGBC marketing and communications team works daily on emails, articles, graphic design and social media. As we seek to stay current with trends and best practices, we find inspiration and education from a lot of other professional sources. CMO.com is a great source of marketing insights, expertise and inspiration aimed at helping deliver standout experiences in a digital world. I like to visit the Moz blog for advice, research, how-tos and insights about SEO and online marketing skills. Digiday offers a global view of the media and marketing industries, as well as the role of technology in these industries. Canva’s blog has some great roundups and resources on different topics related to marketing. It provides a lot of inspiration and ideas to help get the creativity flowing. I like to flip through Communication Arts, both the website and the magazine. It’s a good resource on topics related to various aspects of visual marketing. Their frequent competitions also provide insight on what’s new in different categories throughout the industry. I like A Creative DC—both on Instagram (hashtag #acreativedc) and its website. The feed is a nice way to discover Washington, D.C., through the perspective of its creative community. 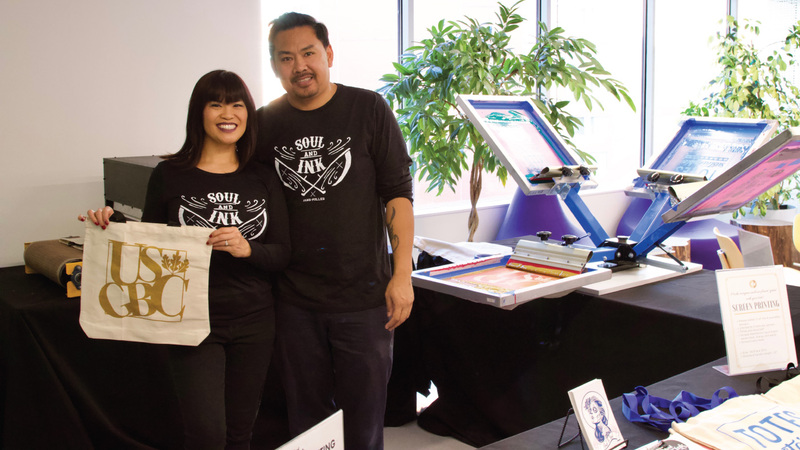 It features all sorts of local creatives and makers, and shows the city through alleyways, murals, retailers, movements, behind-the-scenes content and workspaces. It’s a really refreshing way for me to see what local creatives are doing. For design-specific inspiration, I have been following some letterpress designers and shops—especially Ryan Tempro, based in St. Augustine, Florida. I think in digital design, we sometimes forget to focus on the experience the end customer actually has with our design—a really important component. Letterpress work slows down design, focuses on the fundamentals and forces us to consider some other senses beyond just “does this look good?”. For exploration of tricky grammar and usage questions, I turn to Mignon Fogarty’s “Grammar Girl” blog. Fogarty, a journalism professor, started Grammar Girl as a podcast, and now also publishes articles and social media posts that explain the twists and turns of English for content professionals and the general public alike. Her knowledge and approachable style always leave me with a “huh, great to know!” feeling and the ability to write and edit at a deeper level. The website of the National Trust for Historic Preservation, savingplaces.org, always inspires me, because the Trust shares both the human stories and the architectural details of saving historic sites. At USGBC, we don’t just work with green buildings, but also with people and communities. I find great examples on this site of how social justice and cultural heritage intersect with the built environment. Whenever I need some “emailspiration,” I turn to Really Good Emails. It’s the Pinterest of email design, and you can view emails by industry or campaign type. My favorite part is that each email has a link to the code via CodePen, so you can play around with the HTML and get a behind-the-scenes look at the content. I am a big fan of the Hubspot Marketing blog. Marketing means different things to different people, and everyone does it a little differently. Hubspot sort of sets the standard for a marketing practices. It brings everyone onto the same level. I really love the Google Trends tool, a public-facing Google search data display. It’s interesting to compare two search terms to see what people are interested in. For example, there are close to twice as many searches for “LEED” as for “green building.” That’s not something I would have expected, but it is reflective of consumer behavior in a way that otherwise would have been very expensive to research. 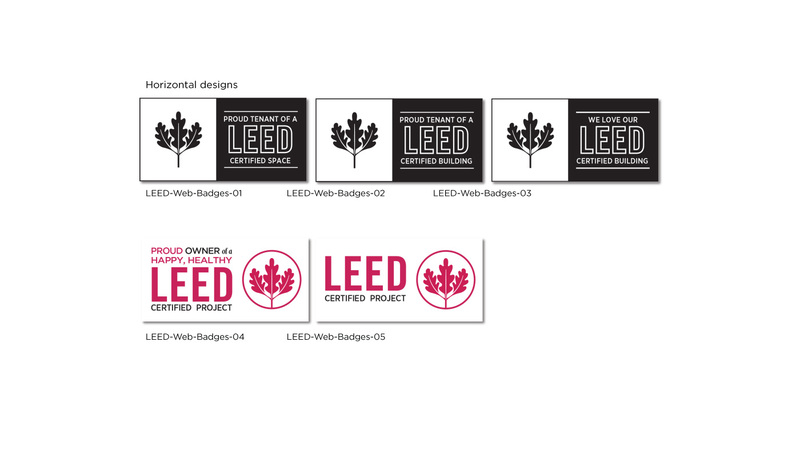 As with our LEED wordmark, USGBC is always looking for ways to help companies promote their LEED-certified and registered projects while still preserving the integrity of the LEED program logo and certification mark. 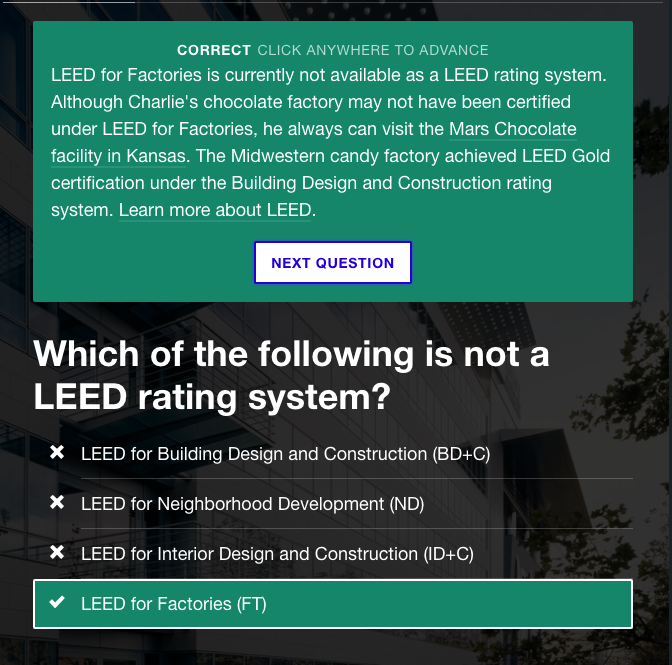 Although projects are able to use the LEED program logo once they have registered their project, and the LEED certification logo once their project has been certified, there hasn’t been a way to display their achievements on websites and other digital locations. We created these badges with an eye towards addressing that need. 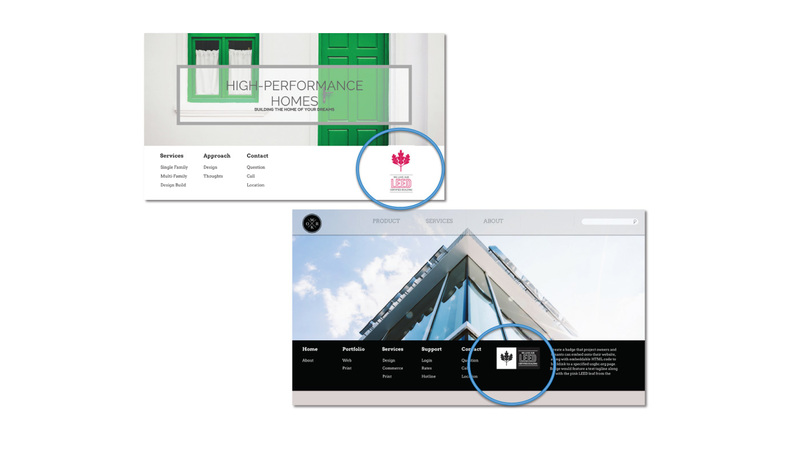 Now, both registered and certified projects have several options for displaying LEED certifications and registrations on their websites, blogs, social channels and any other relevant digital areas, simultaneously allowing us to increase LEED brand recognition. 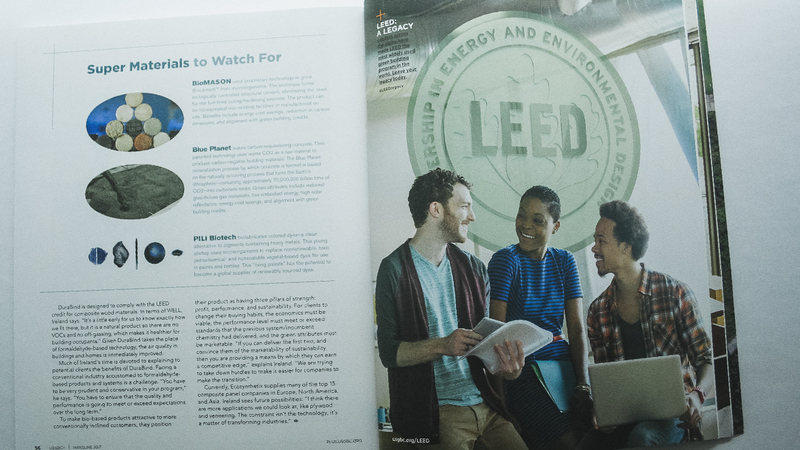 You’ve probably seen USGBC’s LEED print ad campaigns, which have been running in trade publications since fall 2016. The iconic #FindyourLEED campaign has become a fan favorite, capturing the interest of LEED projects across the globe. Focused on helping to elevate the LEED green building rating system brand while simultaneously building brand awareness, this campaign communicates LEED’s flexibility, showcasing sustainability in both the classroom and home environment. We’ve enjoyed seeing all the project teams who have proudly shared photos of their favorite LEED-certified schools, buildings, homes and neighborhoods on social media. At Greenbuild 2016, we distributed cutouts of the iconic leaves, and were amazed to see so much pink on our social media feeds (we also made printable leaves available for those who weren’t able to attend the show). 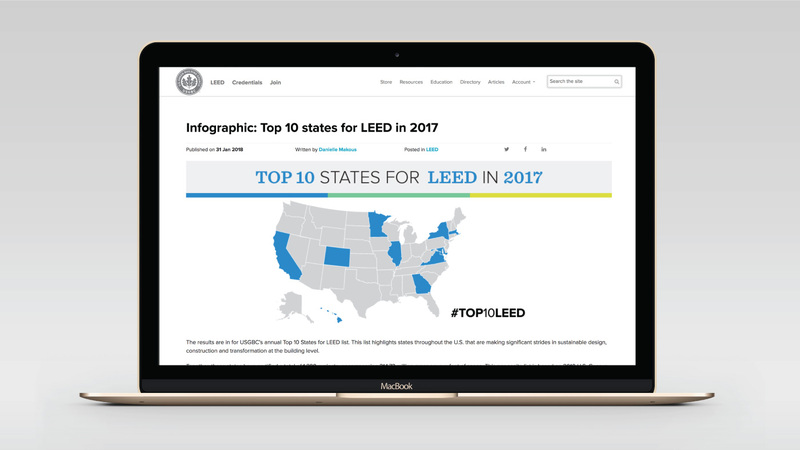 Because of its eye-catching design, the #FindyourLEED campaign has transitioned easily into display advertising, which has been running in tandem with our print ads. 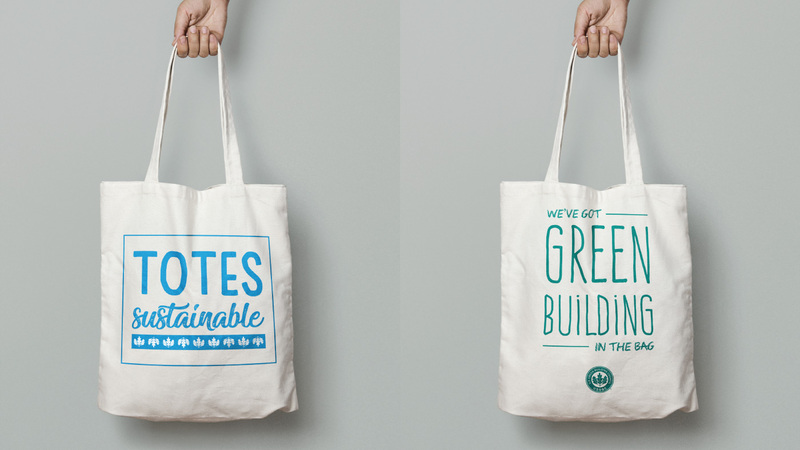 Also in circulation since 2016 is our LEED legacy campaign. Aimed at green building professionals, consultants and building/property owners, this campaign features professionals on the job, encouraging them to leave their own legacy. Check out our campaigns and share your feedback!